Contrary to what I said about not losing weight this week, yesterday morning the scale informed me that I’d lost 2.5 lbs, making me exactly 134.0 lbs! I passed my 10% weight loss goal and have officially lost 16 lbs since the end of March. ^_^ Having very low point days is a good thing. The bad part is that since I had 4 extra points tonight, I decided I could have a cupcake. I did decapitate the frosting, but still, bad habit! In other news, my success has inspired two of my Allakhazam co-workers to join up with Weight Watchers! Wewt! 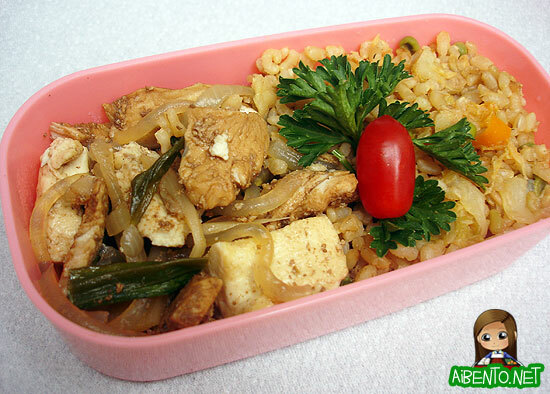 Last night we had a pretty yummy dinner, MIL made chicken tofu with long rice. I nuked one of my frozen packets of kim chee fried rice and added it in to help keep this lunch all Core. I’m still thinking about what to do for a pirate bento and am now considering sitting this one out. It’s a pretty hard theme and not one I’m all that excited about. I do have some ideas for pirate ships. We’ll see! Anyway, here is the top layer. It was quite dreary, so I added the parsley and tomato. Not that it helped all that much. 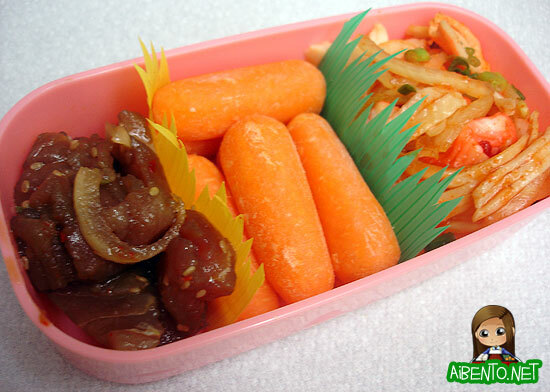 The pupu layer consists of the rest of the ahi shoyu poke, kim chee crab, and some baby carrots. The top carrots are actually sliced in half because it wouldn’t have closed with two layers of carrots. I’ll end with one last bit of exciting news. My friend is currently on a trip in Japan and I had asked him to keep an eye out for these nori punches. He emailed me to say he was able to find them with ease and will be carrying them home for me! The best part is I have avoided the $17 shipping fee I saw on eBay. Good thing I have cast iron will and an amazing resistence to making impulse purchases online!